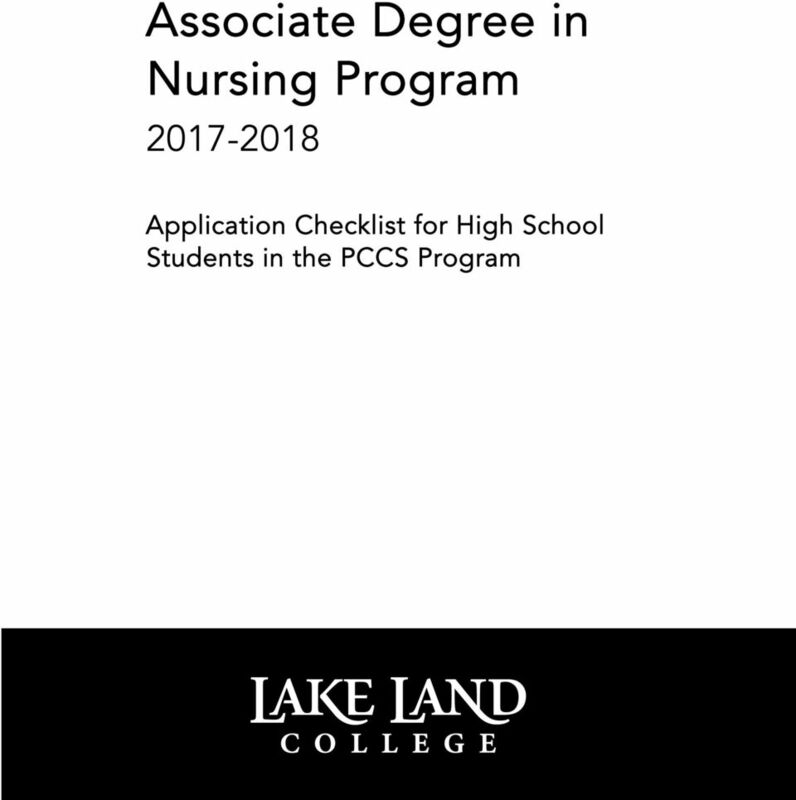 Download "Associate Degree in Nursing Program"
4 Take the following courses in high school. These are the pre-requisites for the ADN program. You must pass these courses with a grade of B or better. 1. Biology either one full year in high school or BIO100, or equivalent AND 2. Chemistry either one full year in high school or CHM 101, CHM 111, CHM 120, or CHM 150, or equivalent. Send high school and college transcripts to Admissions & Records Office. Contact the office at (217) to confirm receipt. Be sure to request a Transcript Evaluation for AAS.ADN.TRK from Admissions & Records Office website to ensure courses that may qualify you for a waiver are evaluated. Nursing Co-Requisite Courses As a PCCS student, co-requisites courses are completed prior to actual program admission. After acceptance into the PCCS program, a 3-year education plan will be made. The first year will include: Course Hrs. Anatomy and Physiology I BIO Anatomy and Physiology II BIO Human Development PSY Nutrition HED Disease Processes or HED Microbiology BIO 235** 4 Composition I ENG Psychology PSY Comp II or Speech ENG 121 or SPE Elective 3 (Select one of the following) General Anthropology ANT 200 Family Relations PSY 278 Principles of Economics ECO 231 Introduction to Sociology SOC 280** Death and Dying SOS 235 Social Problems SOC 282 Abnormal Psychology PSY 273 Social Psychology PSY 277 Racial and Ethnic Groups SOC 286 Ethics PHI 280** Statistics MAT 125** Psych of Maturity & Old Age PSY 275 **Recommended for BSN During the spring semester of the first year, the department will evaluate your transcript. If you have successfully completed the courses according to your plan, you will tentatively be accepted into the nursing program. You must complete the spring semester courses as planned before actual admission is confirmed. 5 On February 1 st, a review of files will begin to determine students for Fall admissions. 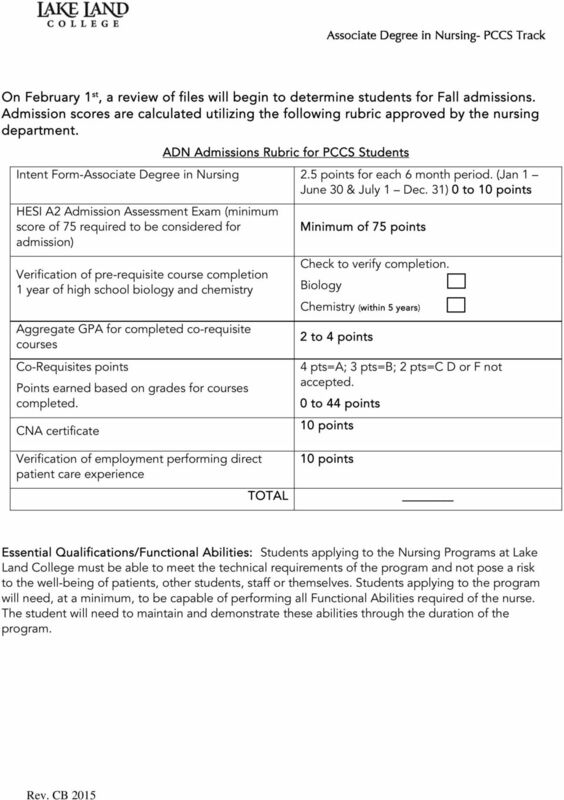 Admission scores are calculated utilizing the following rubric approved by the nursing department. 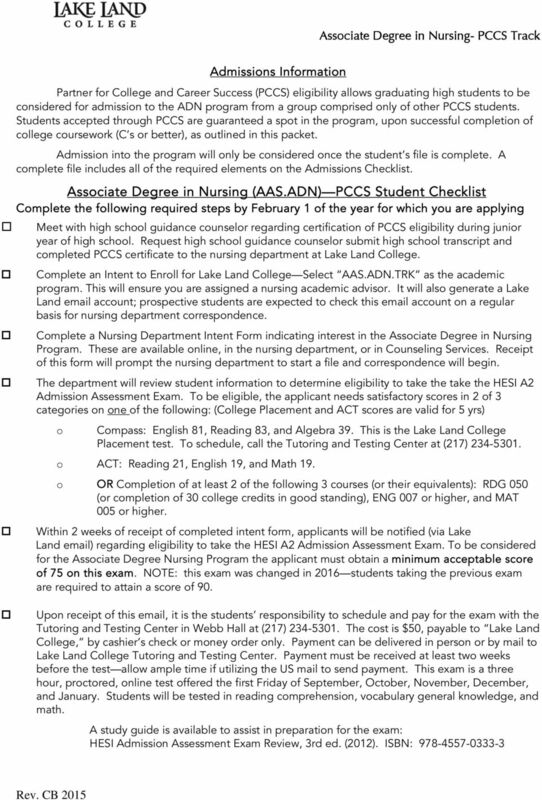 ADN Admissions Rubric for PCCS Students Intent Form-Associate Degree in Nursing 2.5 points for each 6 month period. (Jan 1 June 30 & July 1 Dec. 31) 0 to 10 points HESI A2 Admission Assessment Exam (minimum score of 75 required to be considered for admission) Verification of pre-requisite course completion 1 year of high school biology and chemistry Aggregate GPA for completed co-requisite courses Co-Requisites points Points earned based on grades for courses completed. CNA certificate Minimum of 75 points Check to verify completion. Biology Chemistry (within 5 years) 2 to 4 points 4 pts=a; 3 pts=b; 2 pts=c D or F not accepted. 0 to 44 points 10 points Verification of employment performing direct patient care experience TOTAL 10 points Essential Qualifications/Functional Abilities: Students applying to the Nursing Programs at Lake Land College must be able to meet the technical requirements of the program and not pose a risk to the well-being of patients, other students, staff or themselves. Students applying to the program will need, at a minimum, to be capable of performing all Functional Abilities required of the nurse. The student will need to maintain and demonstrate these abilities through the duration of the program. 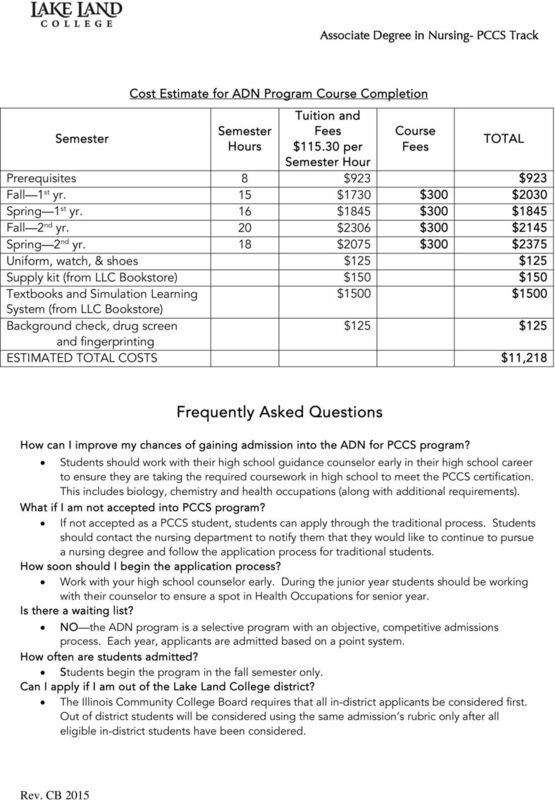 6 Semester Cost Estimate for ADN Program Course Completion Semester Hours Tuition and Fees $ per Semester Hour Course Fees TOTAL Prerequisites 8 $923 $923 Fall 1 st yr. 15 $1730 $300 $2030 Spring 1 st yr. 16 $1845 $300 $1845 Fall 2 nd yr. 20 $2306 $300 $2145 Spring 2 nd yr. 18 $2075 $300 $2375 Uniform, watch, & shoes $125 $125 Supply kit (from LLC Bookstore) $150 $150 Textbooks and Simulation Learning $1500 $1500 System (from LLC Bookstore) Background check, drug screen $125 $125 and fingerprinting ESTIMATED TOTAL COSTS $11,218 Frequently Asked Questions How can I improve my chances of gaining admission into the ADN for PCCS program? Students should work with their high school guidance counselor early in their high school career to ensure they are taking the required coursework in high school to meet the PCCS certification. This includes biology, chemistry and health occupations (along with additional requirements). What if I am not accepted into PCCS program? If not accepted as a PCCS student, students can apply through the traditional process. Students should contact the nursing department to notify them that they would like to continue to pursue a nursing degree and follow the application process for traditional students. How soon should I begin the application process? Work with your high school counselor early. During the junior year students should be working with their counselor to ensure a spot in Health Occupations for senior year. Is there a waiting list? NO the ADN program is a selective program with an objective, competitive admissions process. Each year, applicants are admitted based on a point system. How often are students admitted? Students begin the program in the fall semester only. Can I apply if I am out of the Lake Land College district? The Illinois Community College Board requires that all in-district applicants be considered first. Out of district students will be considered using the same admission s rubric only after all eligible in-district students have been considered. 7 How long is my HESI A2 Admission Assessment Exam score valid? The HESI A2 Admission Assessment Exam scores are valid for five years from the application deadline. If you take the exam more than once, the most recent score is always the score used for admission. How long does the program last? The ADN program is a two-year program. However, there are many co-requisites. 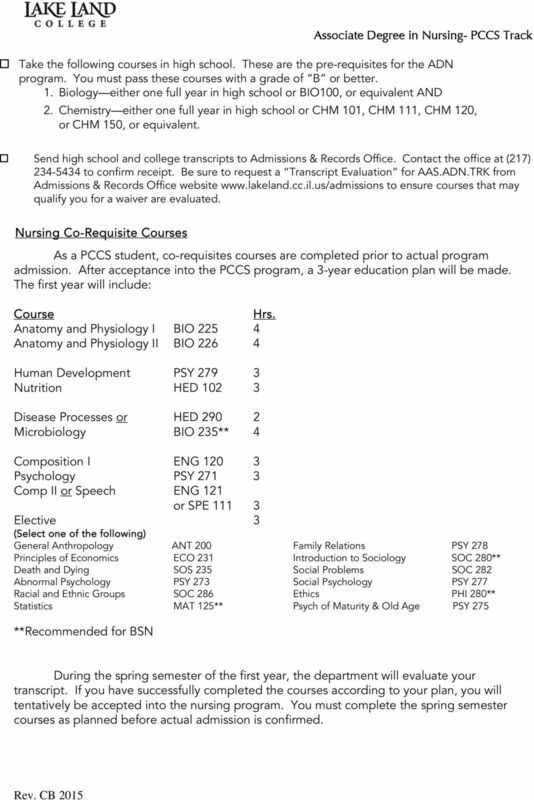 The PCCS program requires students to complete these courses prior to actual admission into the program. Where is the ADN program offered? The ADN program is offered on the main campus and at the Effingham Kluthe Center. Accepted students may register into any open section. How often will I be in school? Once students start the ADN coursework, they can expect to attend class 3-4 days a week. The day off varies throughout the program depending on the clinical assignments. Most clinical assignments require students to BEGIN as early as 6 a.m. Where are clinicals located? Students will have the opportunity to do clinicals in more than one local hospital/clinic/nursing home. So, students have multiple experiences upon graduation. 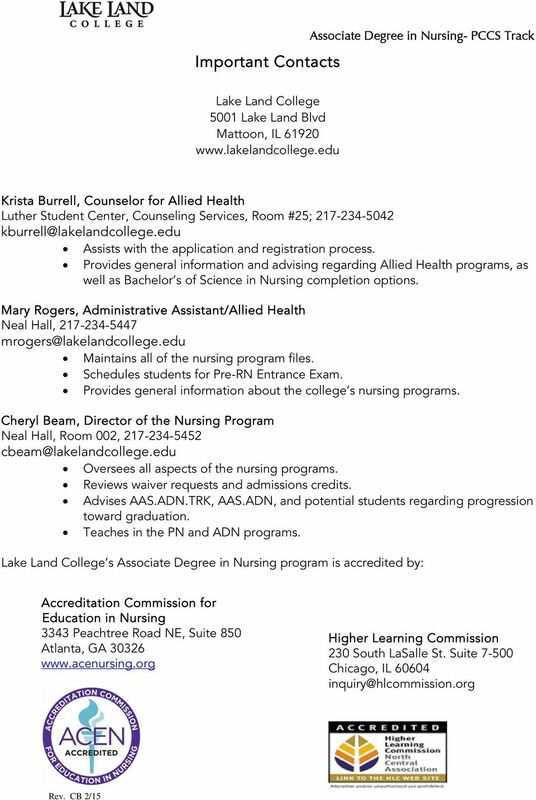 Where can an LLC ADN graduate practice nursing? 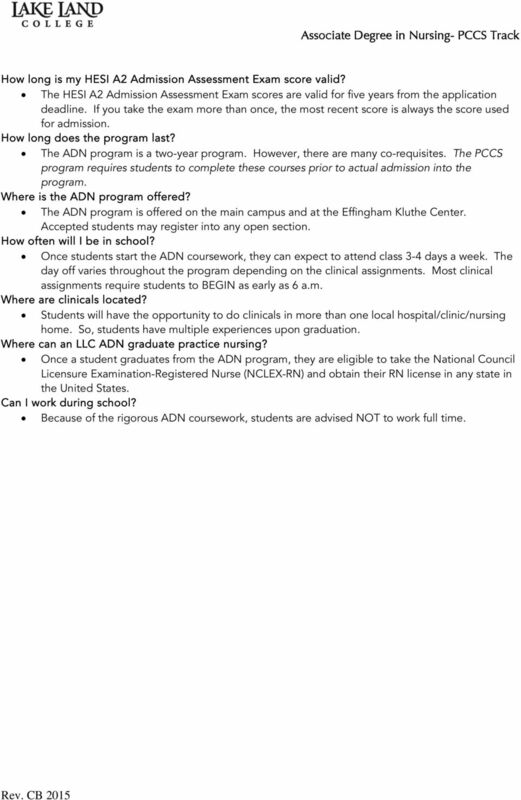 Once a student graduates from the ADN program, they are eligible to take the National Council Licensure Examination-Registered Nurse (NCLEX-RN) and obtain their RN license in any state in the United States. Can I work during school? Because of the rigorous ADN coursework, students are advised NOT to work full time. MARYMOUNT UNIVERSITY. UNDERGRADUATE NURSING PROGRAMS Traditional Transfer B.S.N. Accelerated Second-Degree B.S.N. Hybrid Online R.N.-to-B.S.N.